We are delighted to present the new showroom refurbishment. A refreshed, contemporary look with artisan finishes and a show stopping La Cornue Chateau 165 G4 with copper trim centre piece. The painted cabinetry has been refreshed with a new Farrow and Balls colour, De Nimes No.299. The new quartzite kitchen work surfaces are phenomenal, with the most stunning piece of quartzite for the island. Its durability, beautiful dark inclusions and glittering lustre makes quartzite a beautiful decorative and practical choice for kitchen surfaces. The dark grey lines running through the stone are reflected in the forged steel back splash and bespoke ceiling lighting design. 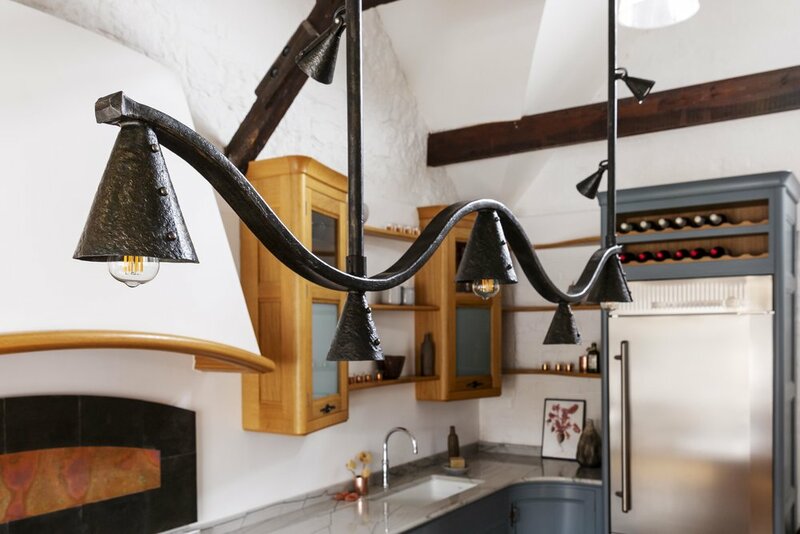 The handles in copper and steel were designed by Figura and made by a contemporary metal artist, who has refined traditional blacksmithing and metalworking techniques in order to make high quality, beautifully finished furniture fittings. These individually designed and commissioned items, showcase the real essence of what Figura can deliver when bringing clients’ visions to life. The backsplash and lighting have been handcrafted to detailed specifications so the finished pieces fit perfectly within the overall design, the style of the property and reflect the unique nature of Figura. The lighting feature unfurls beneath the rafters, an organic shape, reflecting the dark inclusions within the quartzite. To look at it….is to want to own it yourself……. The splashback, subtly lit from behind by LED, is a triumphant backdrop to the breath taking La Cornue range cooker. It is the detailing and craftsmanship of these elements, so in keeping with the ethos of Figura, that really make our interiors stand out from the crowd. The culmination of more than 100 years of research and development, each Château range is entirely handmade at La Cornue’s workshop in the Paris region by their artisans, whose knowledge and savoir-faire are passed on from generation to generation to offer culinary performance and elegance. The pillarless oak carousel unit is beautifully designed and crafted. It’s worth opening the cupboard and having a spin just for pleasure. 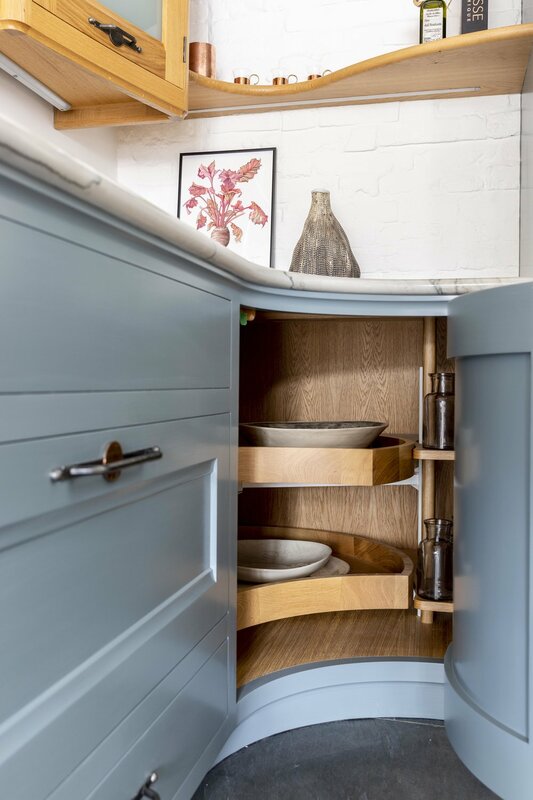 The curved cupboards, which extend to the floor threshold enable to room to flow…a convivial space to cook, gather and entertain. The chopping board, knives and peeling bin are positioned in just the right place to make life easy. Professional styling has helped bring the showroom space to life. There are some beautiful pieces from Baileys and Ingredients LDN. Please visit the showroom to have a look for yourself, you will be very welcome.